We already told you about our new labels and the new look and feel of our line but there is more to tell you because honestly, it’s not just a new label, it’s a total packaging overhaul. For the first time in Annmarie history, we’re adding full-size boxes to our packaging. We have changed a lot about our packaging in the past couple of years and if you have been with us on that journey then you know that we started with bubble wrap, then we tried packing peanuts—both the classic styrofoam and organic made from corn—then we moved to the packaging that we have now with green wrap and kraft paper. Along with every order (and depending on what you purchase), we include cards and a little lavender sachet. What you don’t know is that throughout this time, we have been searching for a long-term sustainable solution that allows us creative freedom, complies with FDA and Health Canada regulations, decreases our overall use of packaging materials, and holds the integrity that the rest of our products do. A lofty goal to say the least, but not impossible—we just had to find the right partners. And we did. All-in-all we interviewed and got samples from about 15 different packaging companies but when our COO found Johnson Printing and Packaging (JPP) at Expo West, a natural products exposé, she knew that this was it! The staff is knowledgeable, their customer support is lovely, and they’re always ready for a challenge. In fact, they say right on their mission statement, “bring us your challenge.” And boy did we! As always, our number one goal is sustainability and staying conscious of our carbon footprint. We care deeply for the Earth and we strive to make that a part of every decision we make as a company. JPP met us every step of the way. They are a Minnesota based company that runs on 100% wind power from the Xcel Energy Windsource for Business Program, which saves an estimated 500 tons of carbon emissions per year—that’s like planting 123 acres of trees every year. We were impressed right off the bat, but the good news just kept coming! JPP developed the first ever post-consumer recycled paperboard. That means that they make the boxes with materials that have been used before. Here is a company after our own hearts, we took the option that our boxes didn’t have to made with any newly-sourced materials. Taking this even one step further, JPP is certified through the Environmental Protection Agency (EPA) for reducing their risk of climate change, the Forest Stewardship Certification (FSC) for their commitment to suppliers that responsibly practice forestry from the logger to the printer, and they are certified by the Printing Industry of the Midwest (PIM) as an environmentally friendly printer company. They even work in a retrofitted building that reduces energy consumption by half and they are a completely carbon neutral company. 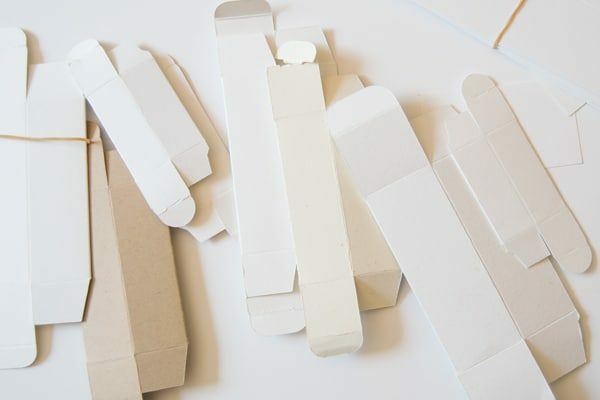 Basically, they’re the packaging company of our dreams! Now that you’re as thoroughly impressed with our packaging partners as we are, here’s a little bit about our new boxes! The material we’re using is 80% post consumer waste and 20% recycled materials. That 20% of non-post consumer waste is recycled from the creation of other manufactured materials. To use less material, our boxes are uncoated—we think it makes them prettier too—and we’ll need a lot less packing paper to protect our full-size products. Because we’ll be able to print directly on the boxes, we won’t have to use the cards and extra information that we send out anymore either! You’ll also notice that our new boxes have barcodes. This may not be so exciting for you, but we’re thrilled. Our warehouse puts all of the packages together by hand, and they do an awesome job, but humankind makes mistakes sometimes. Having barcodes on the boxes means that our warehouse can scan the barcodes on products and get it right everytime! This increases our efficiency and that means we’ll have less re-shipments to make, further cutting down on our footprint! Okay, so you just read an article about sustainable boxes and packaging. We know it isn’t the most exciting topic, but we really wanted to extend a thank you to you. Despite our growth over the past couple of years, we’re still a small company and we honestly couldn’t make any of this possible without you. So many of you have written in asking about our packaging plans and we are so grateful for your dedication to safe, sustainable products from start to finish. You inspire us to stay on the cutting edge of truly Earth-Friendly products. What do you think of our new boxes? Let us know in the comment below! I would rather you put the barcodes on the bottles and remain box free. Maybe then you wouldn’t have had to increase prices. Long time fan but am now looking into other companies.